Over $17k in updates since June! 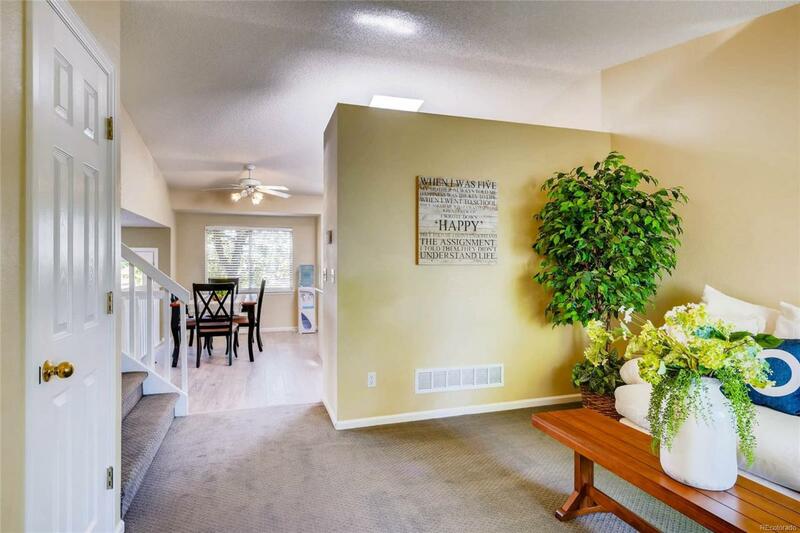 As you enter the front door, you'll be greeted by brand new, grey carpet and wide plank wood-laminate flooring through out the main level with vaulted ceilings. Head into the kitchen and enjoy the beautiful, new granite counter tops, newly painted white cabinets, grey wood-laminate flooring accompanied by natural light streaming from the skylight. Entering the family room, a gas fireplace can be easily enjoyed on cold Colorado days, or on warm Colorado days, experience the new TREX deck. The landscaped yard offers plenty of shade trees, raised garden beds, and backs to open space with access to the Cherry Creek Trail. Newly installed carpet runs through out the upstairs tracing the newly painted trim and tiled bathroom floors. The master bedroom boasts a peaceful space with a master bath and a walk-in closet. Two additional bedrooms upstairs and a full bath makes this home perfect for families. Located just steps from Main Street Parker. Welcome Home!